The Crested guineafowl, or Pucherani guineafowl or Kenya crested guineafowl (Guttera pucherani Hartlaub, 1860) belong to the order of the Galliforms (Galliformes), to the family of the Numidids (Numididae) which groups the birds known with the generic term of “guineafowls”, to the genus Guttera, counting two species. This species forms a superspecies with Guttera plumifera. Are generally recognized 5 subspecies including different forms: Guttera pucherani pucherani Hartlaub, 1860, the nominal subspecies is distributed from south-western Somalia to central-eastern Kenya, in Tanzania and on the islands of Zanzibar and Tumbatu; Guttera pucherani edouardi Hartlaub, 1867, present in eastern Zambia, Mozambique and north-eastern South Africa; Guttera pucherani verreauxi Elliot, 1879 distributed from Guinea Bissau (east) to Cameroon (north-west), in Congo (east) and through Zaire up to Kenya (west), in Angola and in Zambia (west); Guttera pucherani sclateri Reichenow, 1898 present in north-western Cameroon; Guttera pucherani barbata Ghigi, 1905, present in south-eastern Tanzania, in Mozambique and west in Malawi. The name of the genus “guttera” probably comes from the Latin “gutta, ae” that, besides “drop” means also “small spot” in reference to the livery of the species belonging to this genus. The term indicating the species “pucherani” comes from the name of the French zoologist and explorer Jacques Pucheran (1817-1894) to whom the species is honoured. The crested guineafowl, like all the so-called guineafowls, is native to the African continent. It is distributed in a patchy way, with its various subspecies and forms, in a vast central-southern belt (without reaching the extreme south) of Africa. 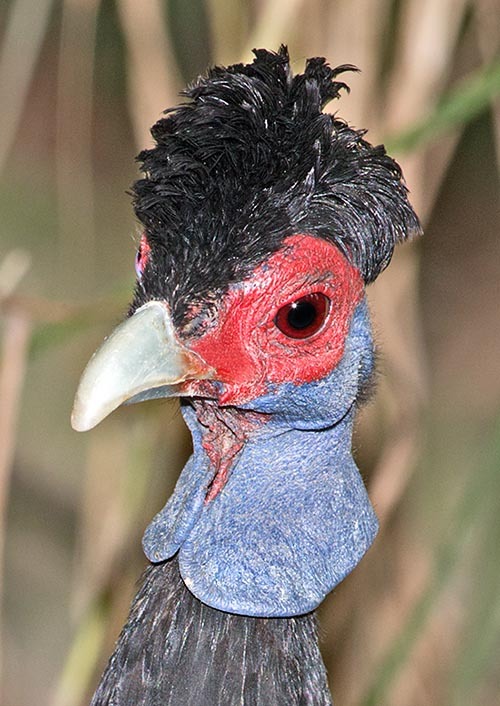 The crested guineafowls live at the margins of the woods, of the secondary forests and in the gallery forests but also in the savannahs presenting forest-savanna mosaic zones. In north-western Zambia it lives in dense woods of Cryptosepalum. Sometimes it frequents also the primary forests as it can overlap the ranges frequented by the white-breasted guineafowl (Agelastes meleagrides). The species has been reported up to 2200 metres of altitude on the Itombwe Mountains in Zaire. Has squat body with dorsal profile rather bent-humped (typical of the guineafowl), rather small head and short tail carried rather under the body. Its length is of 46-56 cm with an average weight of 720-1590 g. It has glabrous head and part of the neck with bare skin of blue colour, grey with spots and portions of red or pale yellow on throat, head and around the eye (differences and variations linked to the subspecies to which it belongs). It has a well developed occipital cutaneous fold that can extend, as a sort of wattles, also towards the neck under the chinstrap. The irides are almost always red or reddish-brown. On the vertex of the head stands a characteristic, thick, wide and a little messed up, tuft of black feathers more or less slightly curled, with variable direction and length depending on the subspecies. 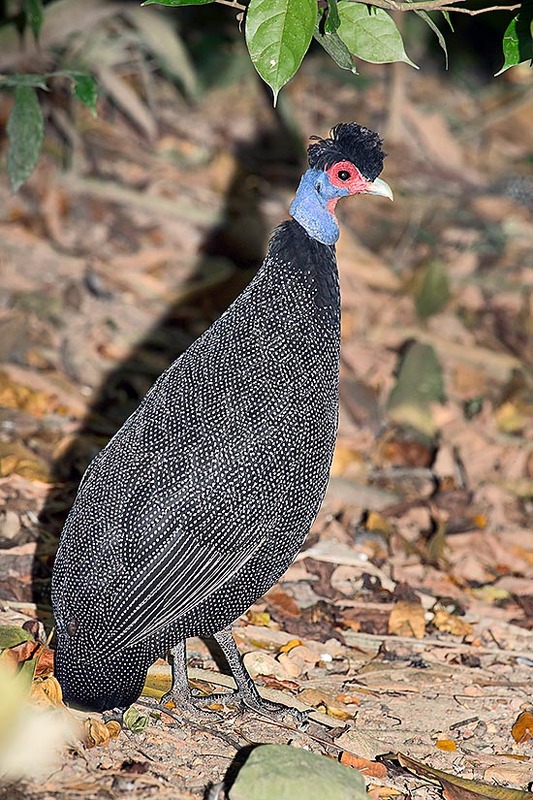 The plumage is black-dark night bluish spotted of white with a multitude of regular “dots” characteristic of the liveries of many species of guineafowls but smaller than those of the properly so called guineafowls (genus Numidia). The primary feathers are brown; the outer barb of the peripheral secondary feathers is white; at the level of remiges the white spots are more lined thus forming some white small lines on the wings. The neck, under the bare part, begins with a black colouration which continues inferiorly with the dotted part, dark shaded are also the rectrices (at terminal level). The beak is robust, slightly curved, of horn grey colour. The paws, strong for scratching, are of slate-blackish dark grey colour. The females are similar to the males but usually a little smaller. The young have an opaque colour, finely barred in white and black with bare skin not yet coloured and dark eyes. Morphologically, the various subspecies distinguish mainly due to the different colour of the portions of the bare skin and especially for the extension and the presence, or not, of the red colour at the level of throat and face. Other differences, between the subspecies, are found at the level of the iris (brown in the subspecies verreauxi presenting also wholly blue head with only the chinstrap red), at the level of form and colouration of the occipital fold, for the shape, the posture and the extension of the tuft of feathers on the head and for the presence and typology of the black feathers collar at level of the neck (more or less extended). Only the nominal subspecies has the red skin surrounding the eye and it is the subspecies having the greater extension of the “red” portion which occupies about half of the portion with bare skin; the subspecies edouardi lacks totally of red colouration and has a whitish-yellowish part at the level of the occipital vault with the rest of the part glabrous and of grey colour; the subspecies sclateri has a short and frontal occipital crest; the subspecies barbata has the glabrous portion of the head almost entirely grey with few red-whitish hues. The crested guineafowl is a sedentary species which however covers huge daily distances doing remarkable wanderings by foot. It is a shy bird and rather difficult to observe. This species has omnivorous alimentary habits; the food of vegetal origin of which it feeds include buds, stems, green leaves, bulbs, roots (like those of cassava), seeds, fruits and berries of Rubiaceae, Amaranthaceae, Compositae, Malvaceae e Leguminosae. The food of animal origin s formed mainly by invertebrates like: larvae as well as adults of coleopterans, grasshoppers, dipterans, ants, termites, millipedes, spiders and snails. It substantially feeds on the ground, scraping and scratching the ground and various debris with the paws, in the typical way of the terricolous galliforms; it is capable however to feed of fruits directly on the trees. The crested guineafowls have been observed while following troops of monkeys for nourishing of fruits these last made falling from the trees. The species has monogamous habits with rather strong pair bonds. The females spawn mainly during the rain season; all the year in the equatorial zones; from November to February in South Africa. The nest consists in a simple hole dug in the ground with possible covering of grass and leaves. It is placed in well hidden locations; close to roots, rocks, at the base of the trees or under bushes. The hatching is formed by 5-14 eggs, at times a couple of females may spawn in the same nest. The fairly roundish eggs have a pink colouration that can turn white or buff depending on the subspecies. The size of the eggs is of about 50-55 x 37,8-43,5 mm. The hatching is done by the female alone; this one proves to be very tied to the nest and to the eggs. The incubation lasts about 22-23 days and the chicks are born covered by a down nicely buff-reddish coloured grooved by many stripes, mainly longitudinal, black-very dark brown that at the level of the head create a sort of marbled drawing. The flight feathers in the chicks grow quickly and they can flutter when 10-12 days old. The young reach the independence, even if remaining in group, by around the month of age; the percentage of survival of the young is rather low. The population, though difficult to observe, appears seemingly stable overall even if locally it can be very rare due to the loss of habitat and due to hunting: is locally fairly common in South Africa. In Nigeria and on other African countries the increasing urbanization and the agricultural expansion: cocoa plantations (Theobroma cacao) oil palms (Elaeis guineensis), rubber (Hevea brasiliensis), etc., united to the excessive and without control hunting has led to the reduction of many habitats suitable for these birds. 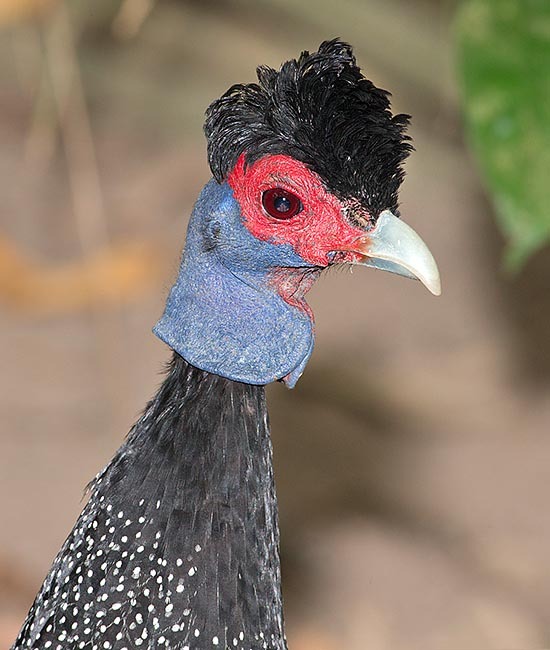 The crested guineafowl, especially the nominal subspecies, is averagely present in some ornamental aviaries; its breeding results being easier than that of other species of fowls. → To appreciate the biodiversity within GALLIFORMES please click here.